To participate in the Saturday Snapshot meme post a photo that you (or a friend or family member) have taken then leave a direct link to your post in the Mister Linky at Alyce's excellent blog, At Home with Books. Photos can be old or new, and be of any subject as long as they are clean and appropriate for all eyes to see. How much detail you give in the caption is entirely up to you. Please don’t post random photos that you find online. This week I thought I'd share a photo of one of my favorite birds, the Stellar's Jay, which lives up in the Ponderosa pine forests of Arizona's White Mountains. Like all jays, these birds with the comic book eyebrows are world class opportunists. This guy saw a peanut and sunflower seed buffet that Denis and I had set out for the ground squirrels, and it flew in for its share! Cathy - What a handsome guy! I love that blue shading! And you got a tremendous 'photo, too. What a great photo! It looks like he's trying to figure out how he can go back for more. That's *exactly* what he's thinking about, Kathy! He does have impressive eyebrows! And I like the description of him as an "opportunist." What a gorgeous bird! Great shot! Not as colorful as our blue jays but obviously he has the same personality. I love the flashes of blue in and out when I throw out stale bread. I've had an affinity for jays since I was quite small and watched a blue jay put the fear of the Lord into a particularly obnoxious stray cat. Thinking about it still makes me laugh! 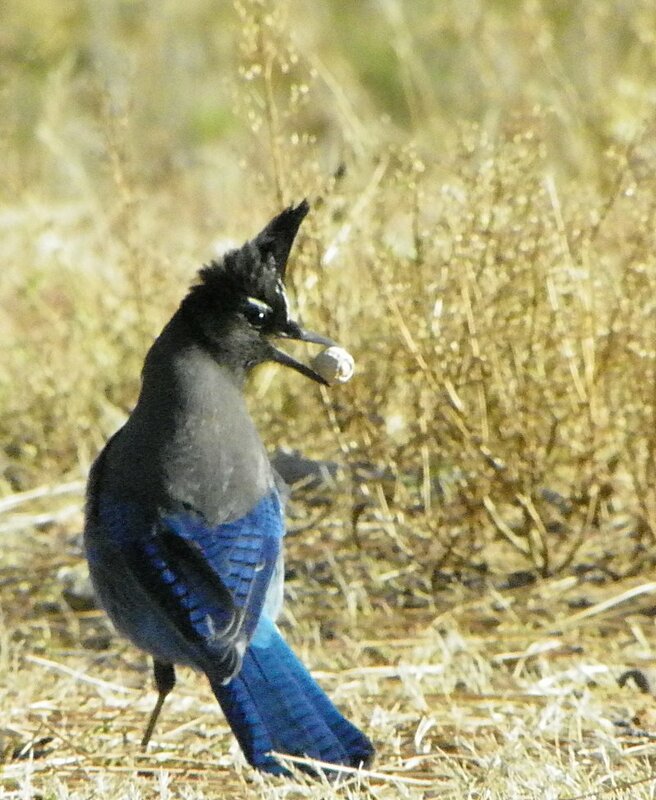 That is a lovely shot of a Stellar's Jay - very vivid blue! I miss seeing them. I grew up on the coast and they were everywhere. Here in the valley, just an hour's drive over the hills from the coast, we don't have any. We have Western Scrub Jays instead. I always appreciate a flash of blue feathers, but scrub jays are drab compared to the Stellar's Jays. When Denis and I stay in Bisbee, Western Scrub Jays always wake me up bright and early. What a great shot!! Your timing was perfect, the clarity couldn't be better. Love the blue! Thanks, Vicki, I'm glad you enjoyed taking a look at this character! They definitely are chancers, Christine. Thanks for stopping by! That's one of the things I love about those birds, too! Hey it's a buffet, love his look, like he's getting away with something. Great photo. I've never seen a bird with a mullet before. He definitely lucked out with the "squirrel" treats so conveniently laid out for him. He'll be coming back to check out the spread often, I think.